We get a lot of inquiries from customers who have purchased gym equipment and need some tips with their weight training. Although it will cost you a bit of money up front you are better off going to see a personal trainer and getting some tips from them. Even if you have been weight training for a while see a good personal trainer will assist you because you may be doing certain things that are hindering your progress. Their is nothing worse than training hard, eating healthy and spending money on supplements and getting poor results. The problem is that not all personal trainers are experienced with weight trainers as others. So we have started a listing of personal trainers that we have dealt with and can vouch for their weight training experience. 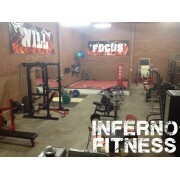 For a Personal Training Gym in Myaree you can't go past our good friend Brad, from Inferno Fitness. Whether it is personal training, or you just want a gym to train in the Myaree area, Inferno Fitness has got it all covered.Brad has been buying gym equipment off us for many years. He recently added ..
We get quite a few enquires here about fitting out studios. Some of them just want to ring around and kick tyres which is totally understandable, and then there are some who have used our gear before and are just super keen to get it in and smash it. Enter Dave from Rock Solid Personal Training i.. If you are trying to build your physique one of the most important aspects is a strong and powerful chest. The good news is that building your chest is an easier task than most people make it out to be. If you follow these simple guidelines, eat the right foods and get plenty of rest you will be ..